Both sides are renowned for their attractive attacking play, and that manifested in an end-to-end encounter. However, without wanting to go all miserablist and Mourinho-esque about it, to proclaim this game a “great advert for the Premier League” would require overlooking some truly diabolical defensive play. When you look at clashes between the Premier League’s title-chasers, they are typically cagey, low-scoring games. The stakes are high, and the margins fine. This match, however, was played with all the reckless abandon of a preseason exhibition match. City will take plenty of plaudits for their stylish swashbuckling, but it’s worth noting that their defending was nearly as bad as ours. This was as bad as it’s been for quite some time. Bear in mind, it’s the first time Arsenal have conceded more than two goals in a game since our opening day defeat to Aston Villa. The Villa game was something of a freak result, but against City we got the hiding we deserved. I think the last time we defended this badly was probably in the 5-7 farce against Reading last October. This time, however, there’s no Martinez or Djourou to hold up as a scapegoat: to a man, we were poor. One of the major strengths of the team this season has been the way they’ve defended as a unit. However, in this match the back four were badly exposed. Arsenal’s midfield simply did not provide the level of protection we have seen since August. It’s something of a fallacy that the best form of defence is attack, but it’s certainly true that a good form of defence is possession. However, Arsenal didn’t look after the ball sufficiently well today — witness Mesut Ozil’s loose pass that led to City’s crucial third goal. Conceding an early goal to a set-piece was a huge blow, but at that stage there was plenty of time to claw things back. However, every time Arsenal dragged themselves back in to the game, they turned around and subsequently fired a bullet right in to their own foot. There has been a lot of talk about physical fatigue, but repeatedly conceding just after scoring suggests we’re mentally tired too. However, I thought he was shockingly bad on the day. It was actually quite arresting to see such a technically-gifted player repeatedly give the ball away. When Flamini was withdrawn in the second half, Wilshere was asked to play the the defensive midfield role. It was something of a disaster. There’s an understandable desire among Arsenal fans to protect Wilshere: he is a huge prospect and is still recovering from an equally huge lay-off. However, performances like today show just how far he is from getting back to his best. Prior to the game, I was one of those who advocated the dropping of Mikel Arteta. Arsene Wenger clearly felt similarly, as he left the Spaniard on the substitutes bench. It was a bold, ruthless selection from Arsene, which I admired — but sometimes gambles fail: Arteta’s positional discipline and intelligent use of the ball were badly missed. I fully expect Arteta to be restored to the side for the Chelsea game. 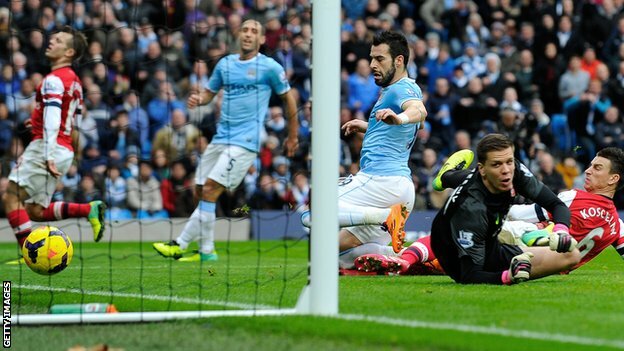 One suspects that Sergio Aguero would have snapped up one of the chances Giroud passed up. As good as Giroud can be, Arsenal still have room for improvement alongside or ahead of him. Before the game, Arsene Wenger insisted he would not blame our heavy fixture schedule. His post-match press conference suggests he’s changed his tune. Several key players looked utterly drained by the 70th minute. There’s no doubt that City have superior strength in depth. Arsenal have many excellent squad players, but City have no squad players. Almost every footballer in their possession would be good enough to start for them regularly. When they rotate, there is no discernible drop in quality. When we rotate, we play Bendtner. Walcott took both his chances well and showed that he could provide some much-needed support for Olivier Giroud. If he can stay fit he will certainly add a different dimension to our attacking play. When Ozil neglected to go over and clap the travelling fans, the usually placed Per lost it a bit. It’s a consequence of frustration on both sides. Ozil was probably embarrassed by the scoreline and his own mistake, and wanted out of there ASAP. Per, as a committed defender, would have been furious to have shipped six goals. I wonder too if he didn’t hold Ozil a little responsible for that misplaced pass when the game was finely balanced at 2-1. Emotions run high — that’s normal. Hopefully that charged atmosphere can be channeled in a more positive way ahead of our next game. If Arsenal overcome Chelsea in the next game, much will be forgiven. However, that’s no easy task: Arsene Wenger has never beaten a Jose Mourinho team. It was a pretty extraordinary game, too. Both sides absolutely went for it: Arsenal because we had the carrot of a seven-point lead before us; Everton because their confidence was buoyed by a win at Old Trafford and they had almost nothing to lose. I was hugely impressed by Roberto Martinez’s side. Granted, we have a couple of big tests coming up in the next fortnight, but Everton are certainly the best team we’ve faced in the Premier League to date. They went for the jugular right from kick-off, and it seemed to catch our team by surprise. Indeed, it took us the best part of 40 minutes to get over our shock and actually start to take the game to the Toffees. Per Mertesacker and Laurent Koscielny were both every bit as good as we’ve come to expect. Romelu Lukaku presented an awkward challenge, and one feared a repeat of the roastings we were regularly given by Didier Drogba – a similarly athletic forward in a blue shirt. However, both centre-halves were at the top of their game. Koscielny in particular seemed to grow in stature as the game wore on, regularly nipping in to win the ball cleanly before bursting upfield to join the attack. The Frenchman was Arsenal’s best player on the day. Tim Howard was in good form to deny both Aaron Ramsey and Olivier Giroud. Had our finishing been a touch better, we could have had an unlikely half-time lead. Our punch-drunk opening was banished to memory as we set about imposing ourselves on the game. The balance of possession was significant redressed, and we won plenty more second balls – especially after the introduction of the busy Tomas Rosicky and Mathieu Flamini. The Welshman was not at his best, and it’s tempting to put it down to tired legs: this was, after all, his 22nd start of the season. There were signs of a performance like this coming his way in midweek against Hull. 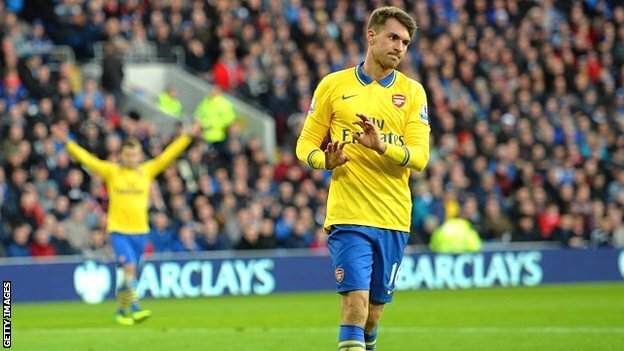 Aside from his delicious assist for Mesut Ozil, Ramsey was unusually wasteful in possession. In the past week, some of his bad habits have crept back in: overly-ambitious passes and unnecessary flicks. He needs to remember that simplicity has been the key to the revival in his game. I’d be tempted to rest him in midweek. Travelling to the Etihad just days days after a crucial Champions League tie against Napoli does look like a daunting task, but if we are to be champions then these are the kinds of challenges we have to overcome. Beyond that, there’s the home tie with Chelsea, and a chance for Arsene Wenger to finally get one over on Jose Mourinho. All Arsenal can do is take it one game at a time. Next stop: Naples. In stoppage time, with Arsenal winning this match by three goals to nil, the cameras caught Arsene Wenger bellowing at an Arsenal player. It may have seemed unnecessary, but I interpreted it as a sign that his focus is greater than ever. Many of us have doubted Wenger’s powers in the last few seasons. What’s clear is that – even if they had ever faded – they have now returned with a vengeance. The manager is more concienciado, more concentrated, more conscious. He’s more demanding. It’s been a long time without winning anything and he’s determined. Arsenal are reaping the benefits of Arsene’s renewed vigour. The way he took the goals was sublime, but his celebration (or lack thereof) underlined his class. For home fans to applaud a visiting conqueror requires a very special set of circumstances. Fortunately, Cardiff fans had the sophistication to recognise that Ramsey is more of a cause for pride than disparagement. I’ve been tentatively critical of his recent displays, but he was excellent in Wales. The two assists were laced with the kind of pinpoint precision one expects of the uber-technician, but his all-round game was excellent too. Mesut Özil completed 38 out of 40 passes in the opposition half today. Two assists. Absolute class. In the first half, there was the rather embarrassing moment when he neglected to play to the whistle and pulled up when through on goal. Then, at the start of the second half, he saw a close-range effort cleared off the line. Giroud can’t be expected to excel in every game – hence why Arsenal need to invest in another forward in January. His cameo from the bench was brief but explosive. Unfortunately for Theo, he may merely have reminded Arsene of how effective he can be as a late substitute against a tiring defence. Being a superb substitute is something of a poisoned chalice. At 1-0, Szczesny made a couple of crucial saves, including one outstanding stop to deny a powerful Frazier Campbell header. The Pole has now kept five clean sheets in his last six games. We now face two home games against Hull and in-form Everton. It’s vital we win both games to give us a cushion heading in to the crucial double-header against City and Chelsea. Fortunately, with the squad returning to something approaching full-strength, we finally have the option to rotate without reducing the potency of the XI. Arsenal had eight attempts on target and should have scored at least two more goals. Mesut Ozil was denied from the penalty spot, while Aaron Ramsey will have been shocked not to have scored from close range. Marseille rested several key players and simply couldn’t keep pace with a dominant Arsenal midfield. Arsene was able to make three changes to his starting XI without compromising its potency. Monreal, Flamini and Rosicky came in and were every bit as solid as you’d expect. There can’t be many better reserve full-backs in Europe than Monreal, while Rosicky must be the only 33-year old who actually increases the tempo of whatever team he’s picked for. When Theo Walcott and Santi Cazorla were introduced from the bench, the mounting options at Wenger’s disposal became starkly apparent. I saw him make his debut there as a 16-year old. Back then, Wenger pushed him out wide to protect him from the hurly-burly of the middle of the park. The unfortunate truth is that, given his injury problems, he still benefits from that protection. His future might be as a deep-lying midfielder but at presents he’s best when liberated from the congestion and conflict of the centre. His goalscoring record at youth level was sensational and typically that returns to a player’s game once they hit their early twenties. Fabregas was exactly the same, and Ramsey is showing signs of emulating that progression. If Wilshere can do so too, Arsenal will have a midfield to reckon with for years to come. As he stepped up to take the penalty, every fan around me watched on in grim anticipation of what was to come. I don’t think I’ve ever seen a German look less likely to score from the spot. By his own excellent standards, Ozil came in to the game in the midst of something of a slump. Hopefully that penalty miss was his nadir, and this can be a turning point. After the spot-kick was saved he immediately looked more energised, buzzing around the penalty area with the bristling resolution of a player determined to make amends. His assist for Wilshere’s second goal was the sort of telling pass we became accustomed to seeing during Ozil’s first few games for the club. I expect the embarrassment of the penalty miss will spark an upturn in form for the mercurial playmaker. Anything other than a heavy defeat in Naples will see us progress. Given the strength of the group, it’s a remarkable achievement – I’d argue it’s every bit as impressive as our domestic form.